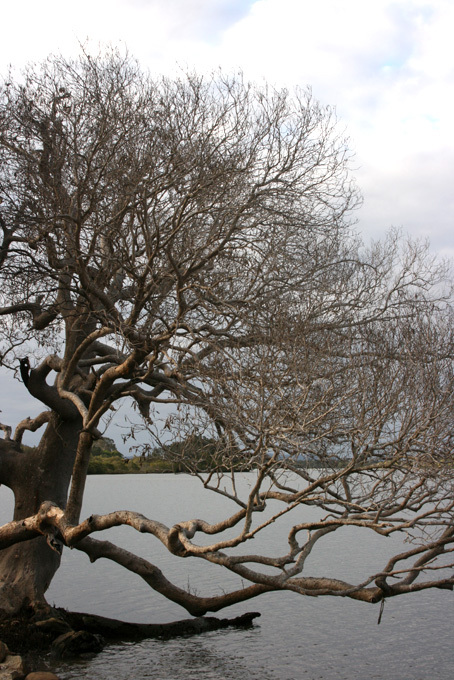 There is an old tree – part of a long ago area of mangroves – that stubbornly is still clinging on. 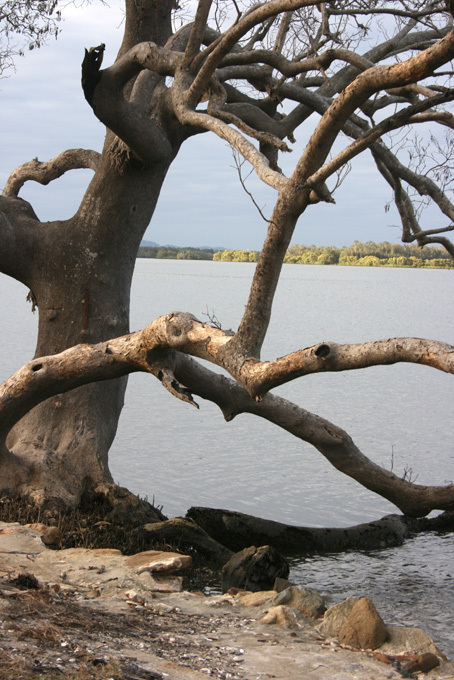 It is on the way into Yamba from the highway at a place called Oyster Channel. I remember this place from my childhood – the much awaited last section of road on the long drive to visiting my grandparents. Every holidays my dad got, we as a family went to visit them from our home in Sydney. 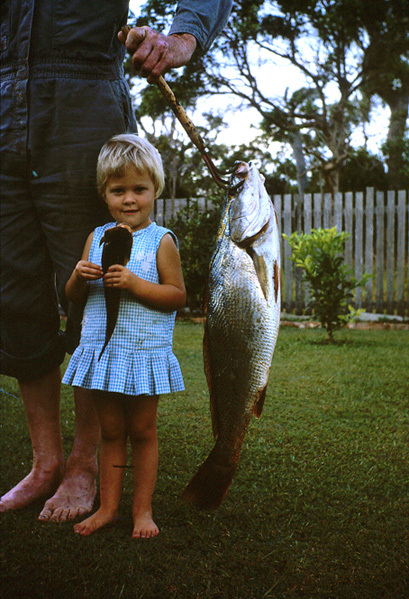 For my father it was always a home coming – to his beloved Clarence River and his favourite pastime – fishing. For us it was swimming, the beach, ‘the pictures’, walks to the shops, reading, general lazy days, wandering days around town and a sense of freedom. 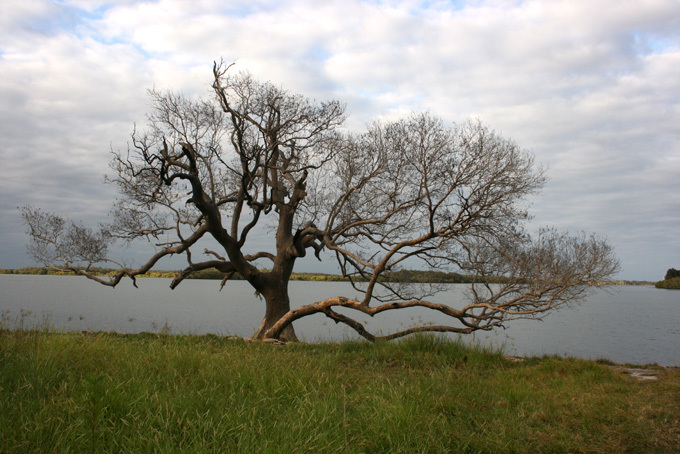 Of course there was always nearly every day – the fishing and the getting of the bait for fishing – yabbying in low tide on the mud flats in stingray holes with yabby pumps and worming and pippying on the beach. As you can see in the photo below we started fishing young! Going fishing often began with the 4am rise time – just so that we could make sure that we got ‘our spot’. I still have visions of my short, quite round grandma, demanding of anyone who happened to have the audacity to get to her best fishing spot before her, ‘get off my rock’. She was not keen on going out much but she loved fishing and would set out with grim determination and a basket of sandwiches and freshly baked ‘grandma’s cake’ for everyone, to make sure she got ‘her spot’. We caught lots of fish and had lots of fun but there were some parts that were less than impressive – the 4 am starts and lets not forget to mention the large buzzing and ravenous scotch grey mosquitoes that also seemed to inhabit in huge numbers ‘the best spots’ – obviously just knowing the humans with the warm blood would be here in ‘their spot’! Oyster Channel and Romiaka were one of the best winter ‘blackfish spots’ with memories of fishing with green weed on the ends of bobbing floats waiting for the fish to grab the line and take the float under water. Both my grandparents are no longer here but the memory of this roadway into town with its low lying roads that in flood times cut the town off (and still does) and the final bridge into town still evokes memories of happy family times. Their house was in River Street opposite the old Public School which has now been moved out of town to make way for the Bowling Club extensions. 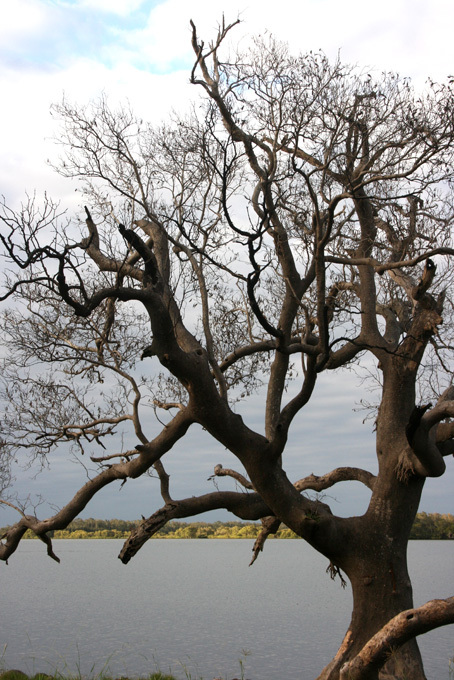 Their house is still standing – well over 100yrs old but like the old tree still hanging on – just. Yamba is not the same as in my childhood. It is no longer the quiet backwater of my childhood and I suspect the next owner of my grandparents old house will be the last before this prime position is ‘redeveloped’. 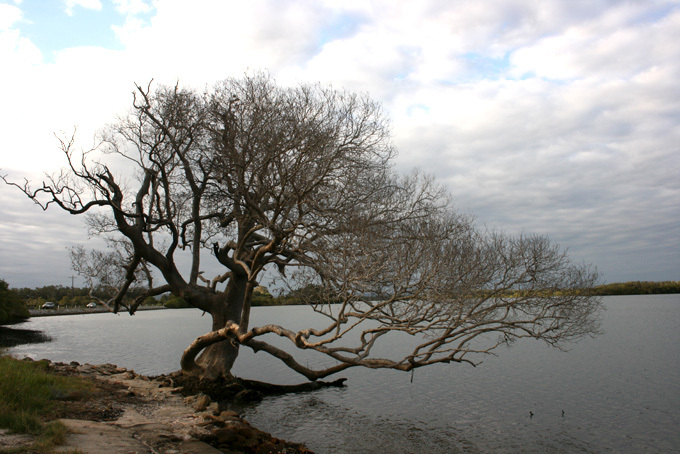 We probably won’t go fishing there again but there are the memories and this tree – battered and worn but still there hanging on – just. What a wonderful story about your grandparents and childhood memories with them. as well. My grandpa was not so much into fishing, but he was a rock hound. I can recall several times hunting for Obsidian Glass in the Utah desert, picking up agates on a rocky beach in Oregon….or spending time in his rock shop, cutting, polishing or tumbling rocks. Things always change, but what lhat lovely memories. They are lovely memories and it was good to look back at some olf photos that I have been scanning recently for the family. Thanks for posting your childhood memories & photos. The tree is glorious though very sad. 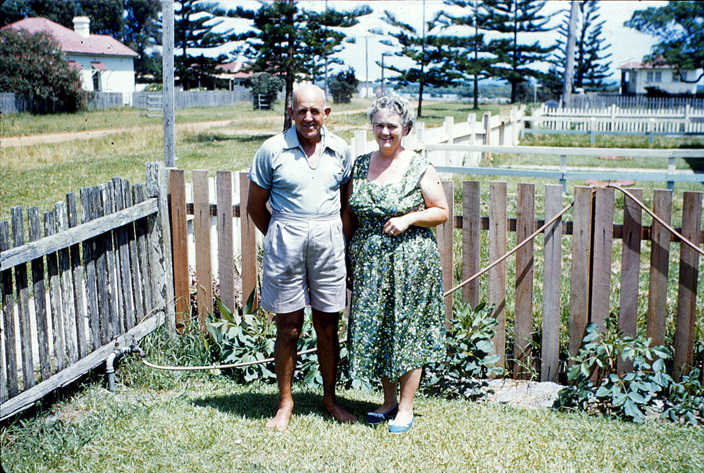 Your grandparents photo [is it 1950’s] is a glorious snapshot in time I think. The picket fences are of a type we no longer see and the whole photo reminds me that both they and that physical environment is gone. So your pics are precious. Are you going to post a pic of their house, would love to see it.